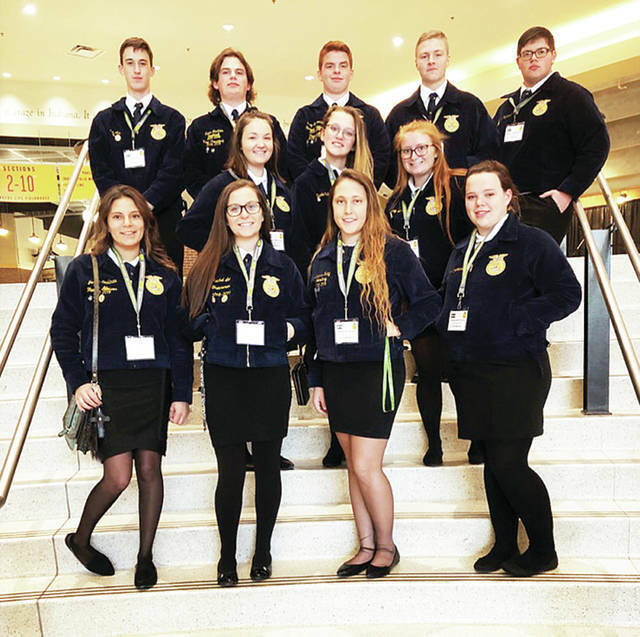 During the month of September and October, Wauseon FFA members showed levels of success throughout all of the various levels of competition for their road-to-state contests. Many members competed at the county level on Sept. 21, while eight individuals moved on to the district level from the agricultural and urban teams.The agriculture team placed third out of six teams at the county level, and the urban team placed third out of six teams. Agricultural team members who entered district competitions were Trey Schroeder, McKayla Clymer, Zevin Gleckler, Jameson Gray, Alyssa Sticklen, Amber Rufenacht, Daniel Hite, and Jaden Banister. Members from the urban team were Jackson Bauer, Isaac Rufenacht, Isaac Wilson, Ian Arps, and Ethan Kessler. On Sept. 25, both teams competed at the Williams County Fairgrounds. At the district level, the agricultural team placed first out of 28 teams. The urban team placed fourth out of 21 teams. Four from each team moved onto the state soil contest. Competitions were held Oct. 13 at Newark, Ohio. The agriculture team placed 30th out of 49 teams; the urban team, 39th out of 47 teams.The agricultural team included Zevin Gleckler, first; Jameson Gray, second; Trey Schroeder, fifth; and Mckayla Clymer, sixth. From the urban team, members included Jackson Bauer, Isaac Wilson, Isaac Rufenacht, and Ian Arps. On Oct. 22, the FFA held its annual chapter meeting. Following the agenda, the members held a chili cook-off. The winners were Wyatt Lane, first place, and Rylee Wreede, second place. FFA alumni and other members then dressed in costumes to hold a Halloween-themed haunted woods for the chapter members to attend. Twelve FFA members left Oct. 24 for the National FFA Convention in Indianapolis, Ind. But first they stopped to tour the Spangler Candy Factory in Bryan. Members were shown how the candy is made and packaged. They also toured Sechler’s Pickle Factory in Fremont, Ind. The conventioneers arrived for the opening session of the FFA event, and later attended a Garth Brooks concert. On Thursday, the members visited Pou Sheep Farm and learned about sheep housing and artificial insemination. They also visited the local career center, where they had the opportunity to meet with college representatives. The third general session of the FFA convention, where national officers gave American Star Awards, followed. During the convention’s fourth general session, the officers gave honorary awards.